Sometimes the best moves are the ones you don’t make. 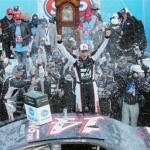 It will be interesting to see how things go for 2004 champion Kurt Busch at Stewart-Haas Racing. There had been some speculation that Busch would join a veteran driver like Matt Kenseth as a rideless racer. He’ll be back in 2018. Kurt Busch has been written off more than once. Controversies sparked departures for the driver of the 41 at Jack Roush and at Penske. Each time, he’s been able to bounce back. While Busch has generally dodged unwanted headlines for the last couple of seasons or so, it will be interesting to see how his pairing with Billy Scott as crew chief works out. Busch started with a bang, bagging the 2017 Daytona 500, but generally flew under the radar performance-wise the rest of the season. One notable change takes place with the 10 car. Danica Patrick has moved on, opening the door for Aric Almirola. Double-A has always been one of those solid, if unspectacular drivers who keeps his nose clean and doesn’t make waves. That’s not a bad thing, but I’m sure he’d love to add to his scant victory total. After toiling for Richard Petty, Almirola will work with what is arguably the best equipment he’s had since his Xfinity Series days with Joe Gibbs. While it wasn’t necessarily a career revival, Clint Bowyer enjoyed a bit of a bounce back in 2017, succeeding Tony Stewart in the 14. An improvement to 18th in the season standings from 27th no doubt fell short of what he really wanted, but at least he had a car he could keep on the track. After a promising start to his career, Bowyer has languished a bit. He was stuck in the ugly demise of Michael Waltrip Racing, and let’s not even get into the season of despair at HScott Racing while waiting for his opportunity at Stewart-Haas Racing. After winning three races in 2012, Bowyer has been shut out since. His fans are hoping that the clever Kansan becomes the next Martin Truex Jr.
It’s hard to believe now, but 2014 champion Kevin Harvick once had one of those protracted dry spells, going winless in 2008 and 2009. The move to Stewart-Haas Racing, Harvick has been gold- a perennial contender. His stat line in 2017 wasn’t as gaudy as 2016. It sure seems as though he is dogged by pit stop problems, which isn’t on him, but his crew. 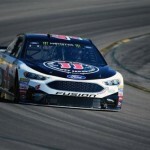 He may be 42, but Harvick shows no signs of slowing down, and should be numbered among the likes of Kyle Busch, Jimmie Johnson, Martin Truex Jr. and Brad Keselowski as one of the top veterans of the sport. While 2017 wasn’t exactly a banner year at Stewart-Haas Racing, it wasn’t a wash out either. Without the polarizing Patrick in the garage, it will be interesting to see how the team earns headlines this season. Every driver here is hungry for better, and there’s no reason to believe they aren’t capable.